Someone on Yahoo! 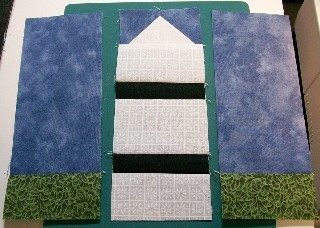 Answers was looking for an easy pieced lighthouse block that did not use foundation piecing. I thought the one seam flying geese unit would make a great top to the lighthouse, so I put this together. It’s a 6″ finished block. 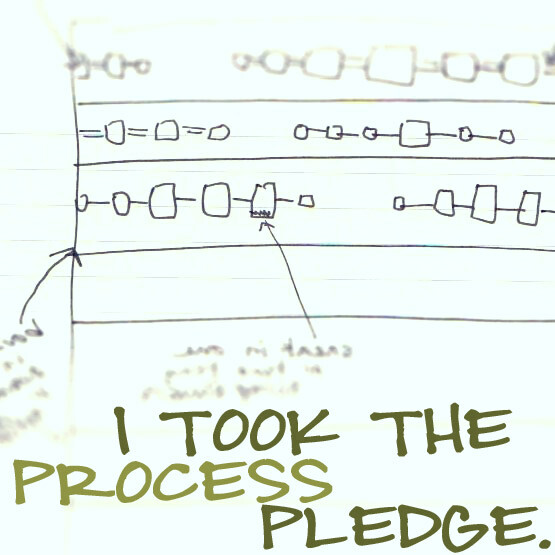 It looks like a lot of pieces, but it’s very easy, and very forgiving for beginners. 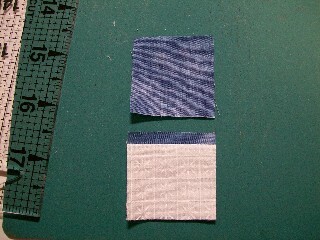 Fold small white rectangle in half, wrong sides together, and finger press the fold. 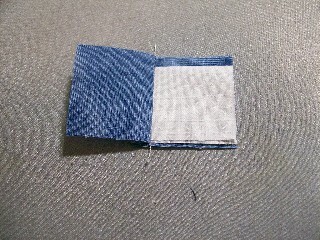 Place on one small blue square, right sides together. 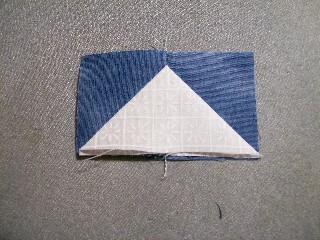 The fold should be at the top, 1/4″ from the top edge of the blue square. 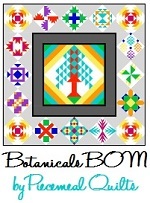 Place second blue square on top, wrong side up (right sides together). 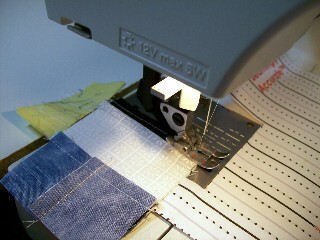 Sew along the right edge of the sandwich. 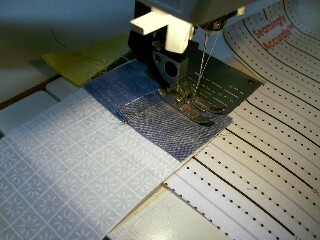 …then open the white rectangle to form a triangle, lining the center finger-pressed line up with the seam. Press. 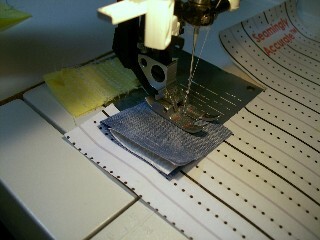 Place the flying geese unit right sides together on one end of the large white rectangle, and sew, then press. 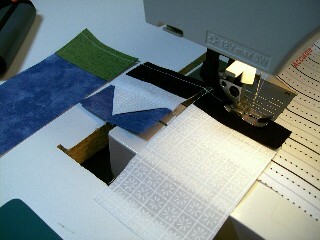 Place the green rectangles on one end of each blue rectangle and chain piece. Figure out approximately where you want the black bands (alternatively, you can skip the black bands and just have a solid white lighthouse), then cut the white rectangle 1/4″ below where you want the black band to start. 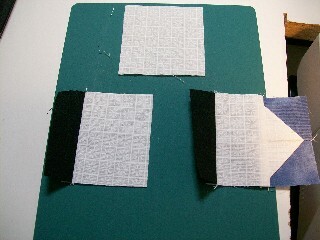 Sew one black rectangle to the bottom of the lighthouse unit, then sew the other black rectangle to one end of the white piece you just cut off. Estimate where you want the next black bar to be, then cut the white rectangle 1/4″ below that point. 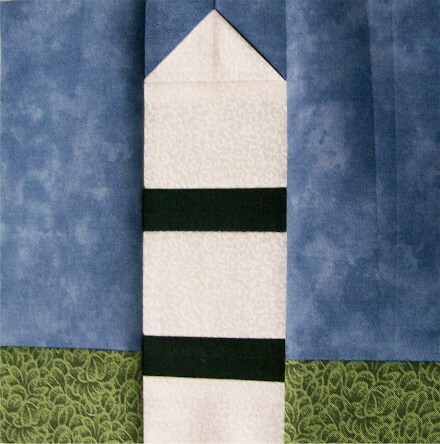 Sew the segments together to complete your lighthouse. 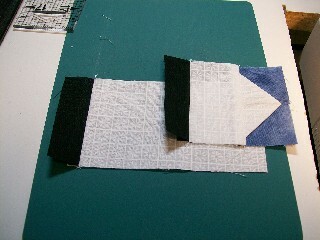 Place your three strips side by side and then sew them together. 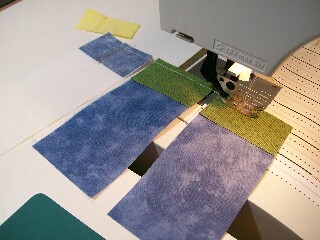 You could cut your blue and green strips an inch wider, then cut an additional 7 1/2″ x 1 1/2″ strip of blue to add to the top. 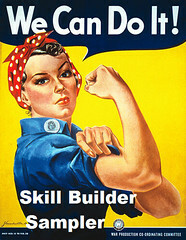 This would give you a finished 7″ block with sky at the top. 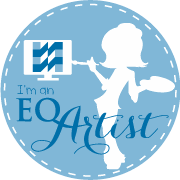 or you could just cut 1/2″ off each side the way it currently is and add a 1 1/2″ strip of blue to the top, to keep it as a 6″ finished block. 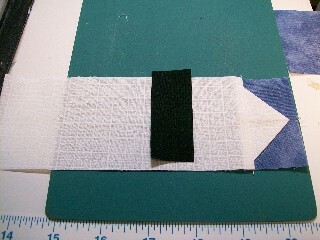 You could also cut your white so it isn’t straight, but widens at the base. 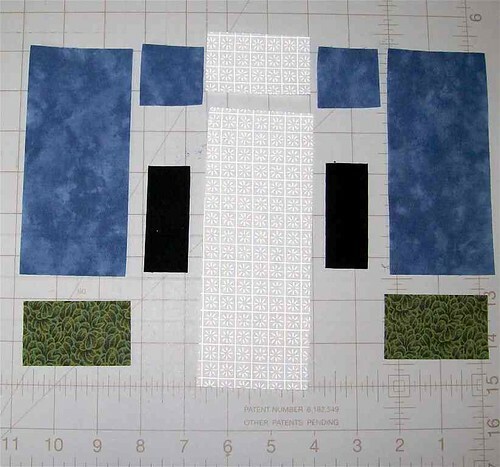 You’d have to cut your blue and green strips differently to accommodate this, but you could always just cut them big and trim the finished block to square when you’re done. That looks great but what if you put a smaller square between two background rectangles to make up a row and then sandwich that between the geese and the column to make it look like the light part of the top.